Enjoy a romantic dinner with sunset celebrations, or order take-out or delivery from one of Islamorada 's many restaurants. Below are several of our favorite home grown restaurants here in Islamorada. Also, find a complete A-Z Dining guide below those. When you dine at Ziggie & Mad Dog`s, you will experience an exquisite meal prepared to your taste and served by the most courteous and professional staff and management team ever recruited. No trip to the Florida Keys will be complete without an evening at Ziggie & Mad Dog`s. Home of a great variety of freshly caught fish in Islamorada. Fresh catch selection changes daily but always includes hogfish, the house specialty. At Chef Michael`s they will also Cook your Catch! A quaint, casual experience. Since 2002 Kaiyo has become a landmark, heralded for its fresh Sushi, inventive Asian cuisine and Connoisseurs` wine list featuring specialty Sakes with inviting names like "Dreamy Clouds" and "Star Filled Sky". Also showcasing Island-influenced, Asian and Wood-Fire Grill cuisine. Beckoning locals and visitors who appreciate great food and exceptional service, travelers making their way through the Florida Keys and tourists enjoying their Islamorada vacation, Kaiyo Grill is lauded for the "freshest Sushi in all the Keys!" A modern and healthy take on traditional Key`s fare. Dinner specials include delectable hogfish when available, succulent Shrimp-n-Grits, and the flavorful MA`s Gumbo, all cooked to order. Excellent Food for an excellent price! Shrimp a million ways, of course and conch, fritters, soup, sandwiches, tacos, salads, burgers, margaritas and amazing homemade desserts. Huge menu, sure to have something for everyone! Fun, family atmosphere. A true conch atmosphere with many tasty delights indulged in Caribbean inspired cuisine. Old Keys style marina and fish shack. Enjoy dining on the bayside deck with tiki torches, watch boats come and go, stroll the open air shops then wander to the sandy beach and melt into a bayside lounge chair to let the sea air wash over you. Famous for great atmosphere and the freshest Florida seafood available in addition to picture perfect sunset dining. Next to World Wide Sportsman. Perfect for the whole family, weekend entertainment, waterfront, casual dining. Huge varied menu. The Island Grill serves up an extensive menu of fresh Florida Keys seafood, indoor and outdoor waterfront seating and nightly entertainment. From award winning Tuna Nachos to Catch of the Day, Seafood LoMein, Thai Beef Egg Rolls, fun family atmosphere. Serving Lunch and Dinner. Come by land or sea! One of the few Islamorada restaurants offering easily accessible boat dockage. Dine on delicious food while enjoying awesome views of the Florida Bay and nightly entertainment. The perfect place to sit back, order a tall, cool drink and let yourself be enchanted by breathtaking sunset views and nightly sunset celebrations. Lazy Days offers fresh seafood, seafood pasta, vegetarian pastas, sandwiches, steaks and chicken. Dine on the outside patio overlooking the beautiful waters of the Atlantic or dine indoors in their cozy yet spacious atmosphere. Large groups and families always welcome. The only restaurant in the Florida Keys where you will find the original Manny & Isa`s Key Lime Pie, truly a tropical treat! Funky little cafe, bakery, coffee shop and retail store. Pride themselves on using fresh, organic, high quality foods in all their dishes. Offer Vegetarian and Gluten-Free dishes. Extensive Menu to choose from. Serving Breakfast & Lunch every day. An Islamorada Restaurant creating Global Cuisine with a local farm to table flavor. oo-tray also has a full bar that specializes as a Whiskey Bar. A place for locals & tourists to enjoy great food and drink in a casual setting. Popular Local`s cafe featuring different themed specials each night and the freshest ingredients. The Food is awesome. Open for lunch and dinner. Delivery available for dinner only. Romantic waterfront dining in one of the most popular restaurants in the Upper Keys. Fresh local seafood, prime steaks, chicken, lamb as well as homemade Continental, Carribean, Italian and Greek cuisine. Fine dining with fresh baked goods daily and food prepared with imported extra virgin olive oil from the family grove located in Southern Greece. Extensive wine selection. Also, Great Pizzas at the Bar!! Islamorada is known as having the best restaurants in the Keys. Our restaurants compete annually for recognition in a variety of categories at the Annual `Taste of Islamorada`. Just take a look at the list below. You will see that for breakfast, lunch, dinner, or snacks, there are many choices, ranging from a local`s flavor to elegant. Many of our restaurants are happy to cook your catch. Enjoy. Cheeca`s famous flagship restaurant is renowned for tropically inspired cuisine. This classically modern dining room features fresh local seafood, prime steaks and organically grown local produce. The Atlantics Edge offers both indoor and outdoor seating and efficient yet unobtrusive service. The menu includes a sumptuous breakfast buffet for the whole family each morning. It has been honored each year with the American Automobile Associations Four Diamond Award for excellence in dining. Bayside Gourmet offers inside and outside dining, a full espresso bar, baked goods, boxed lunches and full service Italian dining beginning at 5pm, beer and wine and free delivery also available. Located next to Otherside Boardsports at mile marker 82.7 on the bayside. French bistro serving gelato, espresso, crepes, sandwiches, and salads. Family Restaurant and Bakery. Specializing in Wedding Cakes. Open for breakfast and lunch. They have a special day email reminder program! Breakfast buffet seven days per week from 7am until 11am at the Islander Resort, a Guy Harvey Outpost - offering a daily buffet with either a Continental breakfast for $6.95 or hot and cold breakfast buffet for $12.95. Open to the public. Caf� & Coffee Roasters with Full Espresso & Tapas Bar/Restaurant with French Bakery and Gelato- Open from 7am until 9pm Wednesday through Saturday and from 7am until 5pm Sunday through Tuesday. Caf� Moka is the place to be! Featuring "Live at Moka" nights with special entertainment guests such as Juanita Dixon aka " Blues Mama "
Popular Local`s caf� featuring different themed specials each night and the freshest ingredients. The Food is awesome. Open for lunch and dinner. Delivery available for dinner only. American Food at America`s Diner. Breakfast, Lunch, & Dinner. Kid`s Menu. Full Bar with Happy Hour Specials, 5 Flat Screen TVs - Open 7 days per week from 7:00 am until 2:00 am. Find them on Facebook. Oceanfront dining with a breathtaking view. Full menu, fresh local seafood. We`ll cook your catch! Kid`s menu, bar, wine list, live music. Open for lunch and dinner. Fine waterfront dining with an ocean view. Reservations suggested. The only thing they overlook is the ocean!! This restaurant at Robbies Marina features delicious food prepared by an award winning chef. It is nice to sit dockside and enjoy a true Keys meal and then maybe feed the tarpons! Picture perfect sunsets while enjoying the freshest seafood. Family friendly, casual, waterside dining. Retail seafood market. We`ll cook your catch. Weekend entertainment. Open for lunch and dinner. "Taste of Islamorada Winner". Catering available. All home-made Italian food & desserts, beer & wine - Free delivery! Open 11:00am until 11:00pm 7 days a week. On Thursdays lunch special is Mexican food! All home-made authentic Mexican food, enchiladas, chille rellanos, tacos and more with fresh home-made salsa and guacamole. Also serving fantastic Greek Salads with olives and feta every day! Fabulous pizza and garlic cheese rolls! Old Keys waterfront restaurant with an oriental flair. Award winning menu with daily specials - catering available. Come by boat, we will cook your catch! Kids menu, three bars, happy hour and live music. "Taste of Islamorada Winner". A casual outdoor raw bar located on the ocean at Holiday Isle - where there is live entertainment on the beach; They are open 7 days a week for breakfast, lunch and dinner and they have a full bar and great food including fried oysters, raw oysters, peel and eat shrimp, coconut shrimp, fish sandwiches and much more! Authentic Italian food from Jersey, located on Overseas Highway at mile marker 88.8. Stop in and enjoy indoor or outdoor seating at one of Islamorada`s favorite local spots, or call and place an order for delivery or pick up. Franchising available. Open Sundays through Thursdays from 11am until 9pm and Fridays and Saturdays from 11am until 10pm. Spectacular oceanfront dining featuring ALL fresh local seafood. Full bar, menu also includes steak, chicken, pasta,seafood dishes. They will cook your catch! Open for lunch and dinner. Reservations are highly suggested. Open Christmas Eve and Christmas Day! Enjoy a taste of Italy at Limoncello, Cheeca`s authentic, casually rustic dining room for the whole family. Savor a Tuscan inspired theme in both atmosphere and cuisine, featuring fresh house-made pasta, hand-rolled pizzas and modern interpretations of classic Italian favorites. Limoncello`s moderately priced menu includes a generous chef-attended Antipasto Bar featuring fresh Italian meats and cheeses, house-marinated vegetables, a raw bar and many other beloved Italian delicacies. For dessert, a variety of refreshing house-churned gelatos are prepared each day. A full childrens menu is offered. Lunch and Dinner on the beach by the Bay. Dinner specials daily. Home of the famous sunset celebration. Outdoor dining with breathtaking sunset and bay views. Breakfast, lunch and dinner daily - turn in at the Mermaid. Backcountry charters available. Come by boat - they`ll cook your catch! Live music. They also do weddings. "Taste of Islamorada Winner". And they sell Gift Certificates which can be used for food, drinks or for the famous Lorelei Hoody Sweatshirts! Open Christmas Eve and Christmas Day! MEAT (Meat Eatery and Taproom) is a comtemporary upscale "quick service" eatery featuring high quality burgers and hot dogs, homemade sausages, natural sodas, extensive craft and microbrewed beers, fresh-made ice cream & milkshakes and great side dishes & salads. They also have fabulous homemade fried chicken from 5pm until it runs out every night and they often have the best chickpea veggie burgers in the world on their "specials" menu. Specialty cakes available. Mangrove Mike`s Cafe is an award winning breakfast & lunch cafe. Southern Living Magazine voted for Mangrove Mike`s as "Best Breakfast in the Keys" in 2012 ! They have also been voted in as the "Best Breakfast in Islamorada" since 1998 in the People`s Choice Awards ! Their off premise catering services are over the top, from flip flops to tuxedoes . They do island parties from 10 to 1,000 guests, and Wedding Wire voted for Mangrove Mike`s for their "Couple`s Choice" Award in 2015. Join them for breakfast & lunch and enjoy a dining experience that is a favorite of both locals & tourists. 40 year old landmark restaurant with indoor and bayside sunset dining. Award winning continental cuisine, fresh local seafood and the largest wine selection in the Keys. Live music at the Tiki Bar on the water. Feed the tarpon from the dock everyday at 4:30pm. Open for lunch and dinner - reservations preferable. Marker 88 will be open on Christmas Eve. Homemade, quality food - A locals oriented restaurant at Mile Marker 81.5 MA`s makes the best hummingbird cake and other home-made from scratch cakes and pies as well as fish tacos, fish sandwiches and much more including their delicious chopped salad! Authentic Mexican restaurant open seven days 11:00 am until 10:00 pm, except on Sundays hours are 11:00 am until 9:00 pm. Comfortable health food cafe and full coffee bar. Great place to relax and enjoy a good meal. Delicious wraps, sandwiches, pastries, and vegan menu items. Full coffee bar with Lattes etc. We roast our own coffee beans. Open for breakfast and lunch. Catering Available! The finest sushi from oceans near and far are handcrafted at Nikai, Cheeca`s celebrated sushi bar and restaurant. Their talented chefs will serve up all your favorites while creating bold new culinary delights in a quiet, intimate oceanfront setting. Simply tell the sushi chefs what you like, or choose from Nikai`s extensive menu of nigiri, sashimi, specialty rolls and more. Nikai`s delicacies are artful and stylish, sure to please the most discriminating palate. Over 35 different hot and cold sakes are also offered. Full Service Restaurant and bar - Catering Service available. Oltremare Ristorante infuses traditional Italian cuisine with a tropical twist. Serving breakfast and dinner, this Islamorada newcomer showcases the Keys plentiful fresh seafood in modern menus that shine with originality. The Oltremare Bar offers an extensive wine list alongside a menu of classic cocktails and signature drinks. Gastronomy & whiskey bar and restaurant specializing in local farm to table and global cuisine. Thursdays they have an amazing late night jam-call for details. Overseas Kitchen is a small, cozy family restaurant with GREAT food, a variety of very delicious beautiful salads, sandwiches, wraps and more. The chefs at Overseas Kitchen have created a wide variety of vegetarian dishes as well as more meaty fare for non-vegetarians. They only use very fresh, high quality ingredients and the food is always consistently excellent. And they also still have the best Greek food anywhere, including their famous Greek salad and their tempting baklava for dessert. 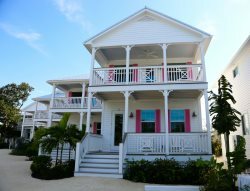 A plantation style house with extraordinary decor nestled in tropical flora on a sandy beach serving French Fusion cuisine with World influences. Featured in Zagat and Gourmet. The Green Flash Lounge has oversized wooden reclining couches on the beach and wicker chairs on the veranda for sunset viewing, and indoors features a wide variety of cordials, wines, and cigars from around the world set amidst dark mahogany woods and heavy leather chesterfield sofas. The upstairs dining room features Tibetan monastery doors and Moroccan, Indian, and African tapestries, wall carvings and artifacts. The upstairs veranda for outdoor dining overlooks the sandy beach, blue bay waters, and stunning sunsets. Lounge opens at 5pm - closed on Tuesdays. Reservations are a good idea. Open Christmas Eve and Christmas Day - reservations required. Signature entrees, Shula cut steaks, burgers, salads, and much more! Caf�, Market and Gallery with Spanish & Mediterranean style Cuisine, Homemade Soups, Freshest Salads and sandwiches, hot and cold tapas and our Featured Paella on Fridays and Saturdays! Plus we offer the finest cheeses and meats sliced to sell. Freshly made sandwiches and salads - made to order ice cream, flash frozen right before your eyes! Free delivery from 11:00am until 10:00pm. Catering, Fantastic Thai Food and Sushi, as well as Chinese Food. Taki Outi is the only Thai Restaurant in Islamorada - Dine in or order out. Great Lunch Specials ! Open Christmas Eve and Christmas Day. On the water at Pelican Cove Resort! Cool drinks and snacks, fresh local seafood. Dine here and enjoy our pool. Cheeca`s stunning Chart Room is one of the most exclusive oceanfront venues in the Florida Keys. Located on the second floor of the main lodge, the Chart Room features an elegant West Indies-style seating area and breathtaking views of Cheeca`s trademark wooden fishing pier and ocean scenes. The bar has seating both indoors and outdoors and is the perfect spot to enjoy a handcrafted cocktail, a light bite or a romantic dinner. Nestled between the free-form pool and the outside deck of the Atlantic`s Edge, this tropical outdoor escape sits on the palm-lined beach and shimmering blue waters of the Atlantic Ocean, with a sweeping view of Cheeca`s trademark wooden fishing pier. Sip a creative Keys-inspired hand-crafted cocktail and swap fishing stories, or simply enjoy the call of seabirds. With a wide-screen plasma TV and friendly bartenders, it`s a wonderful spot for a cold brew, colossal stone crab claws, hand rolled pizzas and the famous Cheeca burger. A local tradition with the coldest beer and the best burgers in the Keys. Happy hour, pool tables, open for lunch, dinner and late nights. Located upstairs at Worldwide Sportsman. Casual dining, cigars and cocktails. Sunset and bay views. Delectable steaks, chops, and fresh local seafood served in sleek, sophisticated surroundings. Featuring orchid-garnished cocktails and international wines. Open 7 days a week. Reservations recommended. Open for dinner only.